He is also the founder of Farmer D Consulting and has spent the past 20+ years designing and building community farms and gardens all over the country for Agrihood communities, resorts, spas, hospitals, non-profits, schools, cities and private landowners. 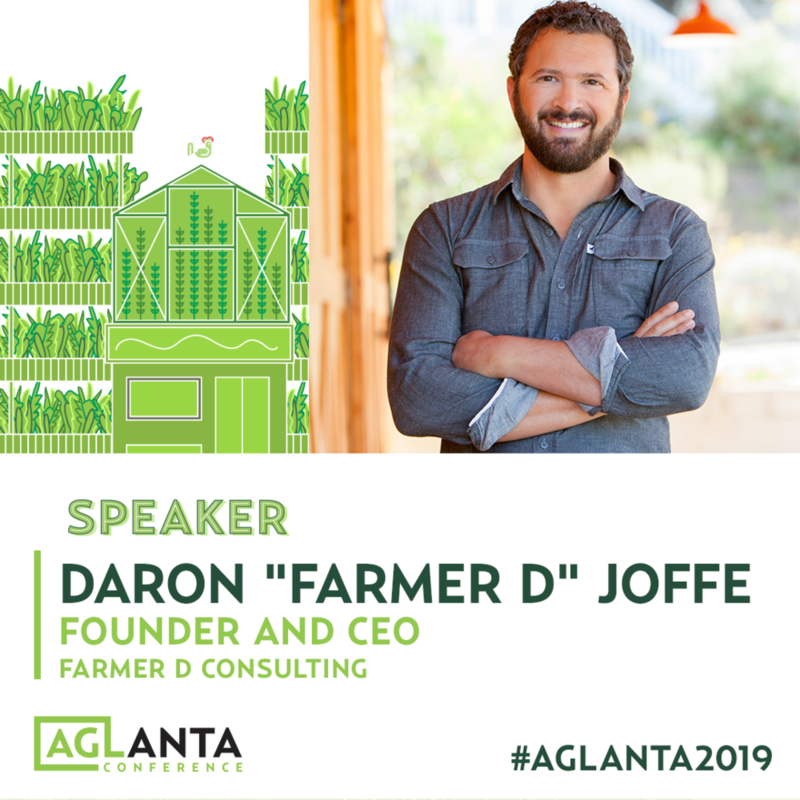 Agritecture sat down with Farmer D before the AgLanta Conference 2019 to learn more about his connection to urban agriculture. AGR: Hey Farmer D! What’s your background? How did you get into urban agriculture? Farmer D: I was born in Johannesburg, South Africa and grew up in Sandy Springs, Atlanta. I went to college at the University of Wisconsin, Madison in 1994 and got into biodynamic farming my freshman year through a workshop I attended at the Michael Fields Institute. My interest in farming was sparked early on in my childhood by my grandmother who loved gardening. When in highschool I got into the Grateful Dead and Bob Marley, which exposed me to a culture of sustainable, healthy living and plant medicine. I found a passion in growing food and when I learned about our food system challenges in this country and around the world as well as the devastating environmental and health impacts from agriculture I became an advocate for local, sustainable food systems and regenerative farming. I often share a story when I was a freshman in college, a time when I was really searching for my purpose in life, and a turkey sandwich put me on that path. I was pondering the origin of my lunch and began to wonder why I didn’t know where any of my food comes from, who grew it and how. I became very curious to learn more about how to grow a turkey sandwich from scratch in an attempt to be more connected to my food and contribute rather than just consume. Over the past 25 years I have been working on several farm projects including many in Georgia such as apprenticing in 1995 with Hugh Lovel in Blairsville, GA, launching a national non-profit jewish farming initiative out of the MJCCA in Dunwoody, starting Full Moon Farms in Athens in 2000, starting the farm at Serenbe in 2002, starting the farm at Hampton Island near Savannah in 2005, helped found Coastal Organic Growers, served as Vice President on the board for Georgia Organics, launching Farmer D Compost with Whole Foods in 2007 and opening Farmer D Organics Garden Center in Atlanta in 2008. For the past 10 years I have been setting up farms all over the country and am currently based in Encinitas, CA where I moved in 2014 to start Coastal Roots Farm. In 2014 I published my first book, “Citizen Farmers - The Biodynamic Way to Grow Healthy Food, Build Thriving Communities and Give Back to the Earth”. I focus my time now on Farmer D Consulting which helps design and build farms in agrihoods and other projects across the country including several hemp initiatives. Most importantly I am a husband and father to three wonderful children. Why do you think agriculture is so important in order to build a community? In my years of working on and running my own CSA farms I saw the power of food to build community. It starts with inspiring people through good food as to the power of food to heal and enliven us as individuals, and then a consciousness grows to connect more deeply with the earth and people which leads to a more connected community of like minded people working together towards common goals. Breaking bread and eating food together is something we have done as humans, families and communities forever. However, in more recent decades people have been further and further removed from growing and sharing in this simple yet profound act that strengthens our bonds with one another and fills us with a sense of belonging. In today’s fast-paced technology driven, industrial society we are so far removed from this process and that is weakening the bonds between people and the earth and with each other. The food system that has emerged through this continues to deteriorate the natural resources we rely on for a healthy planet and people are less concerned and educated about the impacts of their food choices on their own health and the health of future generations. Growing food, learning and being more connected to the process of growing food is a powerful means to inspire people to be better stewards, connect with farmers, the land and their neighbors and nourish themselves, their families and their communities. What is an agrihood and what are some key features of agrihoods? An agrihood is essentially a community built around a working farm that is designed to nourish that community with healthy food and bring the community together to participate in the process of growing food, which strengthens their connection to the land, their food and each other. These communities that prioritize farming as part of life are making a bold statement and commitment to integrate food production with everyday life. Typical suburban sprawl has done just the opposite for decades, pushing farms and farmers further and further away from where people live. Agrihoods provide a solution to suburban sprawl by preserving farmland that can be mutually supported by and for the development and residents. Why do you think agrihoods are growing in popularity? What are the benefits? More and more people are attracted to living in communities with open space, local agriculture and a sense of community and wellbeing. People are becoming more educated about the importance of local agriculture and want to both benefit from the good food it provides and also want to support it as a value to preserve, protect and promote. People want to be healthy and one of the best ways to do that is eating fresh healthy food and staying active. Agrihoods provide opportunities for healthy active lifestyles with access to an abundance of nutritious food. People also want to contribute and be connected to their food, knowing where it comes from and how it is grown. There is also a huge interest in making food and medicine with others whether that’s cooking, pickling, cheesemaking or herbal remedies. Agrihoods really provide wonderful social gathering opportunities where people of all ages come together around food and get to learn, eat and connect. In your experience, what are some challenges that agrihoods face? Farming is very difficult and when you put farms in neighborhoods new challenges arise. While having farms close to people provide lots of opportunities for engagement, education and connection it can also create tensions as many people are not used to having agriculture next door. Farming is hard work and finding talented people willing to work on farms is difficult. Agrihoods are community farms which means they are not just producing food, they are engaging and building community which adds to the responsibilities and challenges already faced by small scale diversified farms. Farming in and with community has many benefits and challenges. The beauty of it is that farmers get to farm and be part of a community and community members get to eat great food and be part of a farm. The kind of small scale farming that people can connect with and participate in requires a community to support it. Doing that kind of farming as a stand alone business is very difficult and lacks the purpose of building vibrant connected community. People want this experience to be part of their everyday life and Agrihoods are one of the best ways to bring community together around food and farming in a way that is synergistic and sustainable. What can we expect to hear from you at AgLanta 2019? As someone who spends every working day in this arena, I look forward to sharing my experiences with designing and creating farms in Agrihoods as well as highlight some current projects and trends that are happening in the Agrihood movement. I recently co-authored a report with the Urban Land Institute called “Agrihoods: Emerging Best Practices” and will share a bit more about how that report came to be and it’s key takeaways. Meet Daron “Farmer D” Joffe at The AgLanta Conference, April 14 & 15 in Atlanta, Georgia! Farmer D will be moderating the panel: AGRIHOODS | Not Just Your Neighborhood Farm.